This post and its photo was provided by Nicholas Heath, a student from Florida State University on the Studies of Emissions and Atmospheric Composition, Clouds and Climate Coupling by Regional Surveys (SEAC4RS) airborne science mission. My name is Nick Heath. I am a PhD student studying meteorology at Florida State University under Dr. Henry Fuelberg. I started surfing when I was 16, and I immediately became interested in the weather and where waves come from. This lead me to FSU, where I received a Bachelor’s in meteorology in 2011 and, more recently, a Master’s in June 2013. My research involves chemical transport modeling. Specifically, I am interested in how thunderstorms transport pollution from the surface to the upper troposphere and lower stratosphere. However, I am still a bit of a weather nerd on the side and I get to indulge in this passion here at SEAC4RS. As a member of the meteorology team, I will get to help prepare weather briefings for each science flight. When the planes are in flight, I sometimes will be a “nowcaster,” meaning that I will be watching radar and satellite to help keep the planes away from dangerous thunderstorms. 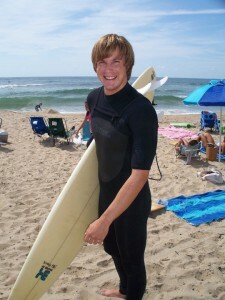 When I’m not doing research or forecasting, I enjoy surfing, basketball, reading, and cooking. Great to read your bio. Abby and I will be following your postings!!!! Previous Previous post: The Pluto science community is rich and diverse, just like its target of study: the ever-fascinating Pluto and its satellite moons. Next Next post: First Science Flight for SEAC4RS!